...could be quite laborious as described in Mayhew's London Labour and the London Poor, 1851. Excerpt below. Of Christmasing—Laurel, Ivy, Holly, And Mistletoe. 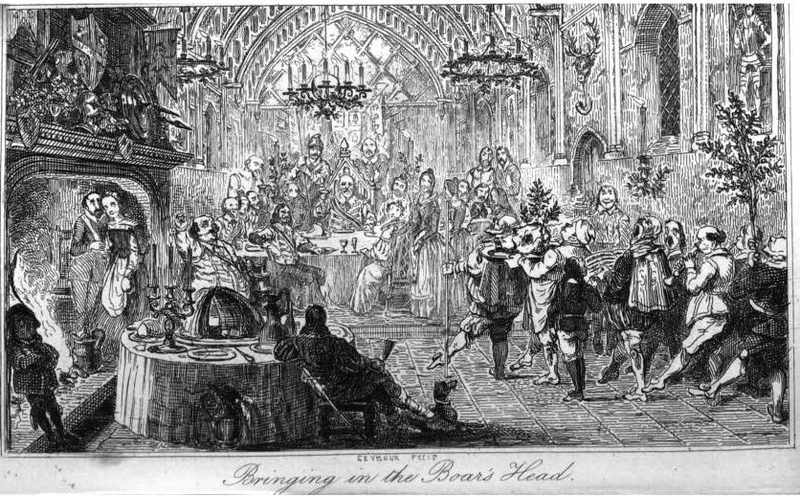 In London a large trade is carried on in "Christmasing," or in the sale of holly and mistletoe, for Christmas sports and decorations. I have appended a table of the quantity of these "branches" sold, nearly 250,000, and of the money expended upon them in the streets. It must be borne in mind, to account for this expenditure for a brief season, that almost every housekeeper will expend something in "Christmasing;" from 2d. to Is. 6d., and the poor buy a pennyworth, or a halfpennyworth each, and they are the coster's customers. In some houses, which are let off in rooms, floors, or suites of apartments, and not to the poorest class, every room will have the cheery decoration of holly, its bright, and as if glazed leaves and red berries, reflecting the light from fire or candle. … In London there are upwards of 300,000 inhabited houses. The whole of the evergreen branches sold number 375,000. 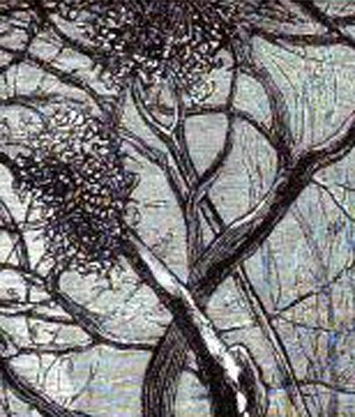 Mistletoe, I am informed, is in somewhat less demand than it was, though there might be no very perceptible difference. 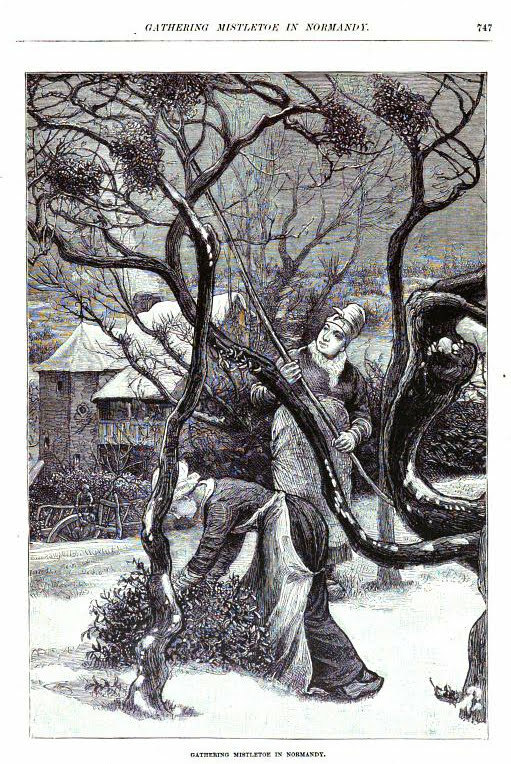 In many houses holly is now used instead of the true plant, for the ancient ceremonies and privileges observed "under the mistletoe bough." 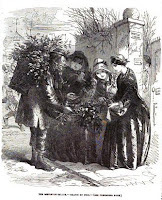 The holly is not half the price of the mistletoe, which is one reason; for, though there is not any great disparity of price, wholesale, the holly, which costs 6d. retail, is more than the quantity of mistletoe retailed for Is. 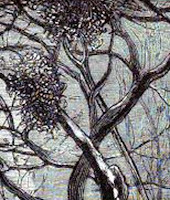 The holly-tree may be grown in any hedge, and ivy may be reared against any wall; while the mistletoe is parasitical of the apple-tree, and, but not to half the extent, of the oak and other trees. It does not grow in the northern counties of England. The purchasers of the mistletoe are, for the most part, the wealthier classes, or, at any rate, I was told, "those who give parties." 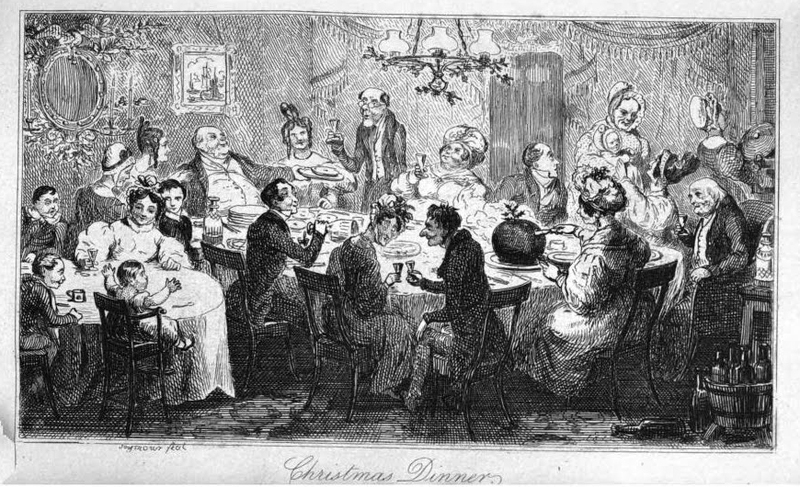 It is bought, too, by the male servants in large establishments, and more would be so bought, “only so few of the great people, of the most fashionable squares and places, keep their Christmas in town." 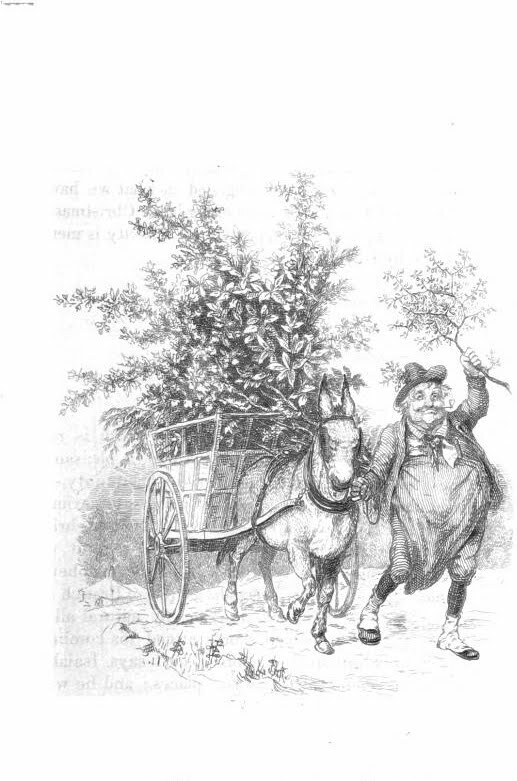 Half-a-crown is a not uncommon price for a handsome mistletoe bough. The costermongers go into the neighbourhood of London to procure the holly for streetsale. This is chiefly done, I was told, by those who were "cracked up," and some of them laboured at it "days and days." It is, however, a very uncertain trade, as they must generally trespass, and if they are caught trespassing, by the occupier of the land, or any of his servants, they are seldom "given in charge," but their stock of evergreens is not unfrequently taken from them, "and that, sir, that's the cuttingest of all." "It's hard work, is Christmasing; but, when you have neither money nor work, you must do something, and so the holly may come in handy. I live with a elder brother; he helps the masons, and as we had neither of us either work or money, he cut off Tottenham and Edmonton way, and me the t'other side of the water, Mortlake way, as well as I know. We'd both been used to costering, off and on. I was out, I think, ten days altogether, and didn't make 6s. in it. I'd been out two Christmases before. O, yes, I'd forgot. I made 6d. over the 6s., for I had half a pork-pie and a pint of beer, and the landlord took it out in holly. I meant to have made a quarter of pork do, but I was so hungry—and so would you, sir, if you'd been out a-Christmasing—that I had the t'other quarter. It's 2d. a quarter. I did better when I was out afore, but I forget what I made. It's often slow work, for you must wait sometimes 'till no one's looking, and then you must work away like anything. I'd nothing but a sharp knife, I borrowed, and some bits of cord to tie the holly up. You must look out sharp, because, you see, sir, a man very likely won't like his holly-tree to be stripped. Wherever there is a berry, we goes for the berries. They're poison berries, I've heard. Moonlight nights is the thing, sir, when you knows where you are. I never goes for mizzletoe. I hardly knows it when I sees it. The first time I was out, a man got me to go for some in a orchard, and told me how to manage; but I cut my lucky in a minute. Something came over me like. I felt sickish. But what can a poor fellow do? I never lost my Christmas, but a little bit of it once. Two men took it from me, and said I ought to thank them for letting me off without a jolly good jacketing, as they was gardeners. I believes they was men out a-Christmasing, as I were. It was a dreadful cold time that; and I was wet, and hungry,—and thirsty, too, for all I was so wet,— and I'd to wait a-watching in the wet. I've got something better to do now, and I'll never go a-Christmasing again, if I can help it." 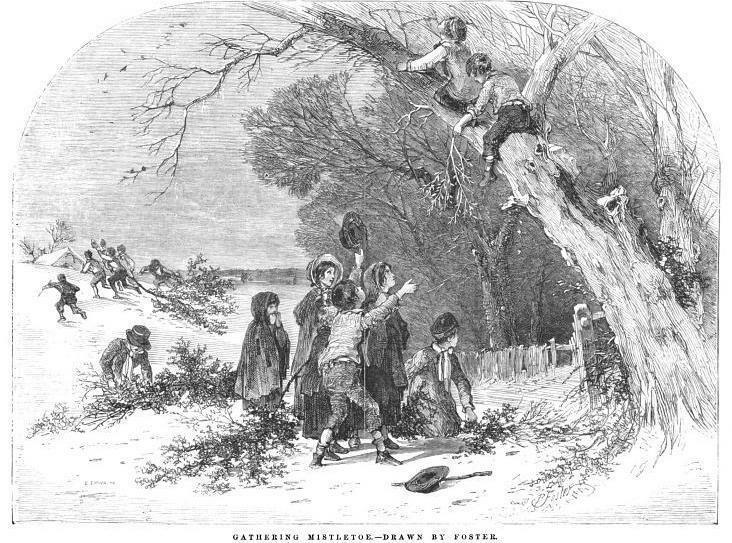 This lad contrived to get back to his lodging, in town, every night, but some of those out Christmasing, stay two or three days and nights in the country, sleeping in barns, out-houses, carts, or under hay-stacks, inclement as the weather may be, when their funds are insufficient to defray the charge of a bed, or a part of one, at a country "dossing-crib" (low lodginghouse). 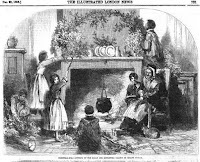 They resorted, in considerable numbers, to the casual wards of the workhouses, in Croydon, Greenwich, Reigate, Dartford, &c, when that accommodation was afforded them, concealing their holly for the night. 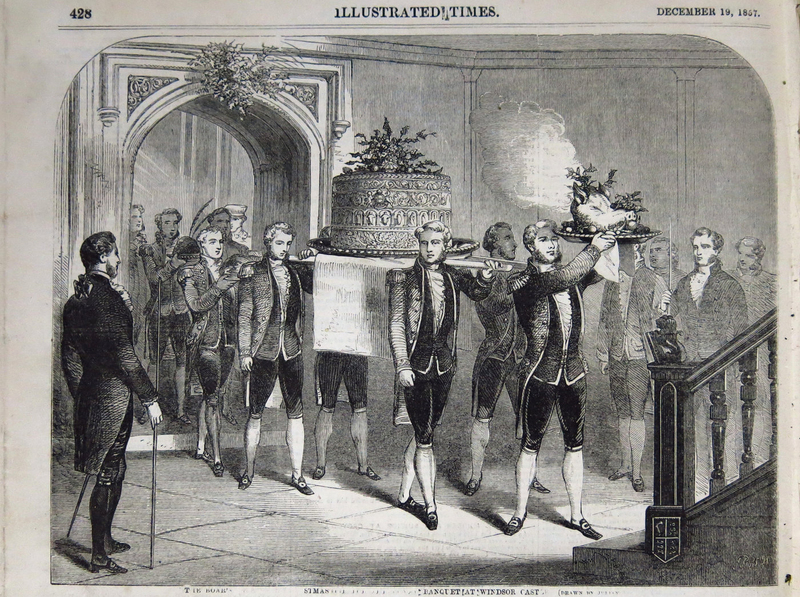 As in other matters, it may be a surprise to some of my readers to learn in what way the evergreens, used on festive occasions in their homes, may have been procured. The costermongers who procure their own Christmasing, generally hawk it. A few sell it by the lot to their more prosperous brethren. What the costers purchase in the market, they aim to sell at cent, per cent. Supposing that 700 men and lads gathered their own holly, &c, and each worked for three weeks (not regarding interruptions), and calculating that, in the time they cleared even 15s. each, it amounts to 5757. One of my informants alluded incidentally to the decoration of the churches, and I may observe that they used to be far more profusely decked with Christmas evergreens than at presentl so much so, that a lady correspondent in January, 1712, complained to "Mr. Spectator" that her church-going was bootless. 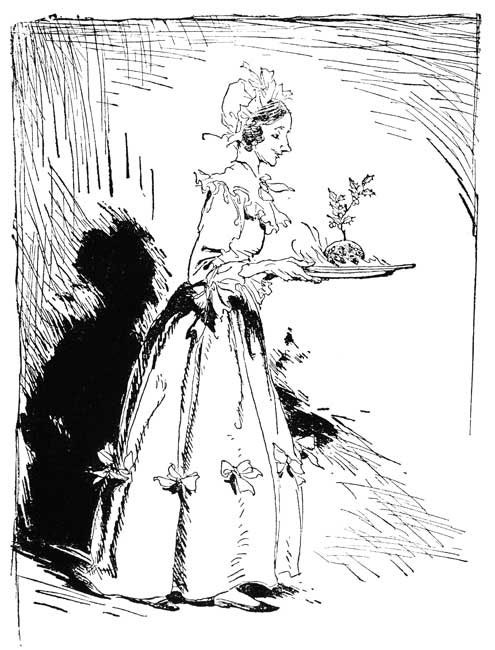 She was constant at chureh, to hear divine service and make conquests; but the clerk had so overdone the greens in the chureh that, for three weeks, Miss Jenny Simper had not even seen the young baronet, whom she dressed at for divine worship, although he pursued his devotions only three pews from hers. The aisle was a pretty shady walk, and each pew was an arbour. The pulpit was so clustered with holly and ivy that the congregation, like Moses, heard the word out of a bush. "Sir Anthony Love's pew in particular," concludes the indignant Miss Simper, "is so well hedged, that all my batteries have no effect. I am obliged to shoot at random among the boughs without taking any manner of aim. Mr. Spectator, unless you'll give orders for removing these greens, I shall grow a very awkward creature at chureh, and soon have little else to do there but to say my prayers." In a subsequent number, the clerk glorifies himself that he had checked the ogling of Miss Simper. He had heard how the Kentish men evaded the Conqueror by displaying green boughs before them, and so he bethought him of a like device against the love-warfare of this coquettish lady. Of all the "branches" in the markets, the costers buy one-half. This season, holly has been cheaper than was ever known previously. In some years, its price was double that cited, in some treble, when the December was very frosty. In former times, as we learn from Stow, in his Survey of London , not only were our houses and churches decorated with evergreens, but also the conduits, standards, and crosses in the streets;—and, in our own day , it continues to form a garniture not only of our temples and our houses, but constitutes a portion of the striking display made at this festive season, in our markets and from the windows of our shops. Holly forms a decoration of the shambles; and every tub of butter has a sprig of rosemary in its breast. There is a very beautiful custom which we find mentioned, in connexion with the subject of evergreens, as existing, at this season of the year, in some parts of Germany and Sicily [Christmas trees]. 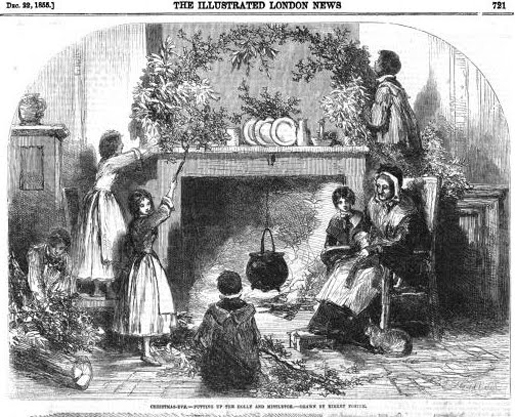 A large bough is set up in the principal room, the smaller branches of which are hung with little presents suitable to the different members of the household. 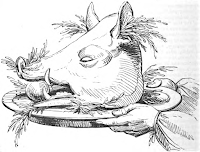 … The rosemary, besides its rich fragrance,—and probably because thereof—was supposed to possess many occult virtues; and was used, for the sake of one or other of them, on occasions both of rejoicing and of mourning. 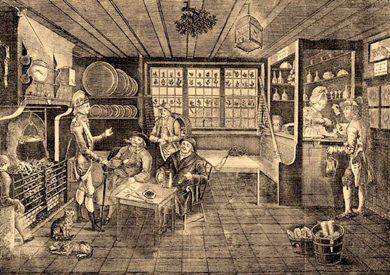 It was believed to clear the head, to strengthen the memory, and to make touching appeals to the heart. For these reasons, it was borne both at weddings and at funerals…. 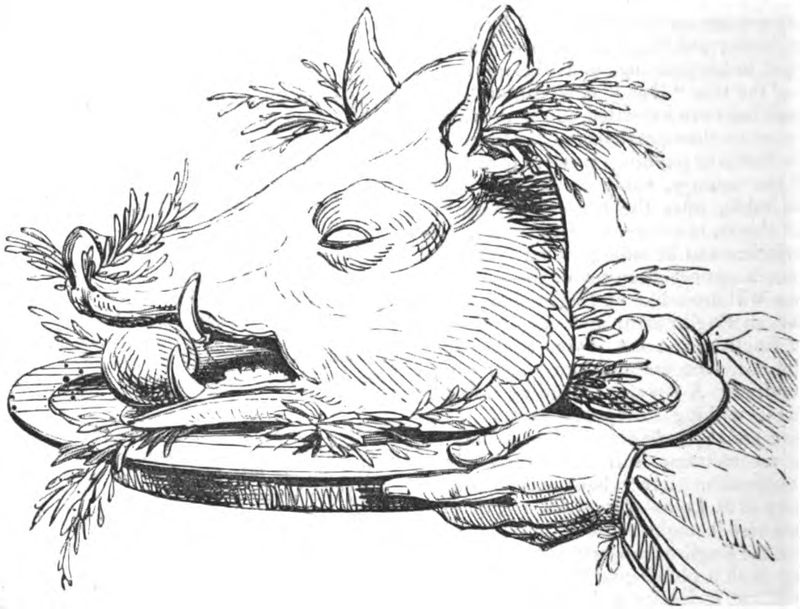 The fact of its being in bloom, at this season, would naturally introduce the rosemary, with all its fine morals, into the Christmas celebrations:—and such customs as that which prescribed that the wassail-bowl should be stirred with a sprig of this plant, before it went round amongst friends, seem to have a very elegant reference to its secret virtues, (“that's for remembrance,” perhaps;) and suggest that the revellings of the season, in those old times, were mingled with the best and most refined feelings of our nature.